Description: This Butterfly Bookmark is an easy Macrame pattern, suitable for school age children. Kids under the age of 7 may need some help. You could use this simple butterfly decoration to make key chains or jewelry projects, since the bookmark portion is optional. Just make sure you tie some type of knots with the ends. In the example shown, I used 2mm size Paracord. If you use this material, an Adult needs to heat the ends to melt the fibers. 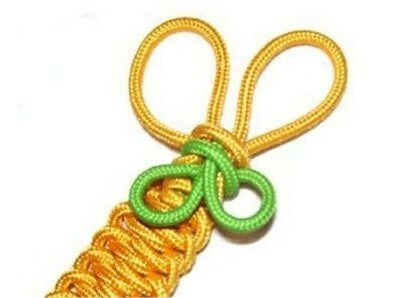 Only two knots are used: The Overhand knot (butterfly), and the Half Hitch (for the bookmark). Cut 2 pieces of material, each 90 inches long. Apply glue or tape to the ends so they dont unravel. Step 1: Secure one cord to your board, at the center. 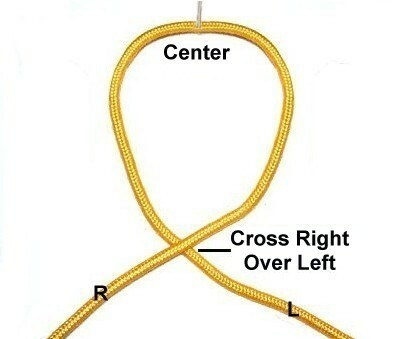 Make a loop, crossing the right portion of the cord over the left. 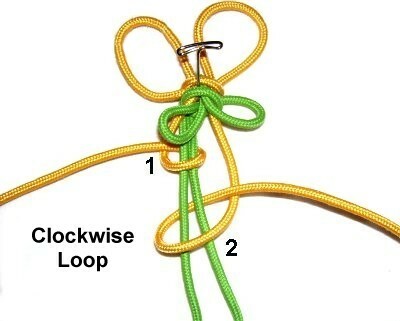 Step 2: Bring the right portion through the loop from below. 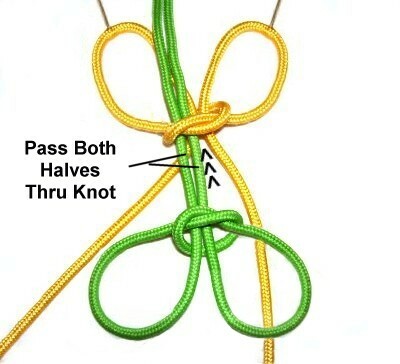 Tighten the Overhand knot until the opening is about the size of a quarter. 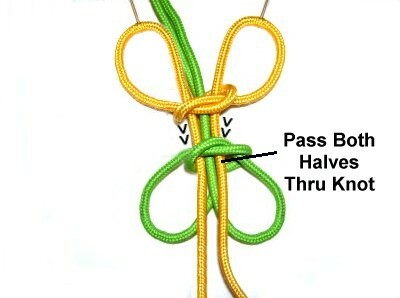 Step 3: Pass the ends through the Overhand Knot, forming two loops at the top. 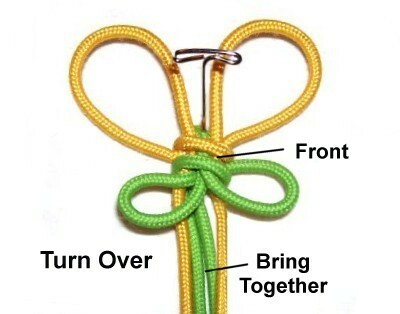 Tighten the Overhand Knot further, but still leave a small amount of space. Step 4: The design you just made is for the upper wings (yellow). Repeat steps 1 - 3 to make the lower wings (green). The loops for the lower half of the butterfly should be smaller. Step 5: Place the lower set of wings between the ends coming from the upper wing design. 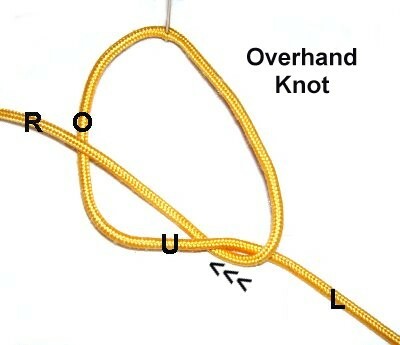 Pass the ends through the Overhand Knot, heading upward. 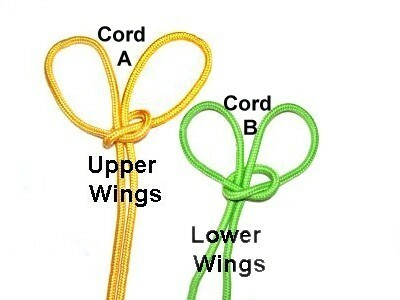 Step 6: Pass the ends for the upper wings through the Overhand knot of the lower ones, heading downward. 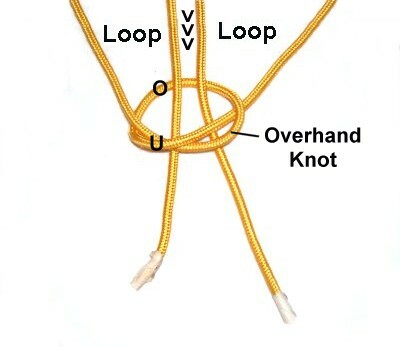 Tighten both Overhand knots firmly, adjusting the loops as needed. 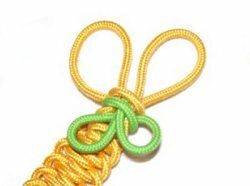 You can stop here and simply tie Overhand knots in the two ends at the top (green). Those will be the antennas. The other ends can be used to attach the butterfly to something, such as a belt or a key ring. Step 7: Flip over the Butterfly Bookmark. Bring down the ends at the top (green), so they rest between the other two (yellow). To make the Bookmark portion, you will be tying Half Hitches. The instructions are below. You can use a different type of knot if you wish. Step 8: The ends you brought down are the holding cords (green). The ones coming from the upper wings are the working cords (yellow). Use the left working cord to make a Half Hitch onto the holding cords. The loop will be counter-clockwise. Tighten it so it's close to the lower wings. 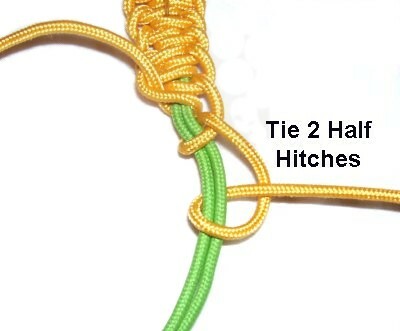 Use the right working cord to make the next Half Hitch. The loop is made in a clockwise direction. 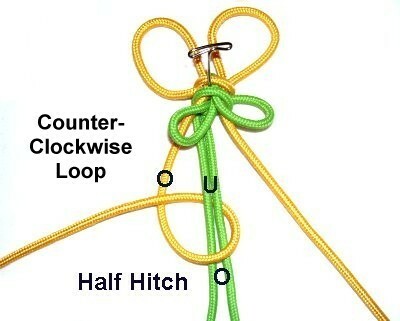 A Half Hitch is tied by passing the working cord over - under the holding cords. Pass the end over the cord you are using, as you pull it out to the side. Step 9: Repeat step 8 several times. Stop when the Butterfly Bookmark is the size you want, or you are running out of material (working cords). Step 9, continued: Use each end to make two Half Hitches instead of one. Apply glue to the holding cords, and then tighten the knots firmly, so the glue is inside. Apply glue and cut off the extra material when it's dry. Have Comments about the Butterfly Bookmark? Contact me.